Posted May 26, 2016 by Melissa Slive & filed under Blog, Learn How to Prep. Put on your lab coat, safety glasses, and thinking cap! Success on the ACT science section calls for science savvy and a strategic approach. Below are the strategies to help you get those Eureka! moments. In order to maximize your time and score, you want to spend your time on the quickest questions first. Remember that every question carries the same weight. Start with the 3 Data Representation and 3 Research Summaries (Experimental) Passages, and save the 1 Conflicting Viewpoints Passage for the end. This passage takes the longest because there are usually no visuals. The Conflicting Viewpoints Passage requires a different strategy and way of thinking. It will break you out of your focused mindset of reading graphs, tables, and other visuals. So be sure to save it for the very end. Data Representation (30-40% of Questions) – These questions have you read graphs, interpret scatterplots, and explain information presented in tables. While some knowledge of the subject being tested is helpful, what is more important is your ability to read and understand data. 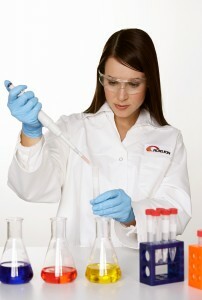 Experimental (45-55% of Questions) – These questions require you to interpret the design and results of experiments. Again, specific content knowledge isn’t as important as knowledge of the scientific method and data collection. Conflicting Viewpoints (15-20% of Questions) – The final question type on the ACT science section tests your ability to understand, analyze, and compare alternate viewpoints or hypotheses. These questions will center around a single situation or problem, and you will read two or more different viewpoints and compare the similarities and differences. For the Math thinker, you sometimes get stuck in the numbers and lose site of the main point. Don’t recalculate all of the data or get lost in numerical details. Focus on the main ideas of the passage. If you get frustrated obsessing over numbers and then realizing you didn’t need them to answer the question, you are getting stuck. Try to refocus your attention by looking at the question first, figuring out exactly what you need to answer the question, and then going back and looking for only that information. For the English thinker, you might get stuck and overwhelmed by the visuals, numbers, or big science terms. Don’t panic over the numbers. Write your own notes in the margins to help you stay focused. For the Science thinker, don’t get stuck in dissecting the experiment or research or the science terms. Do not overthink the passage content. If you find yourself trying to fully understand the experiment and then realizing you didn’t need to, you are getting stuck. Most questions test your ability to understand scientific data by reading graphs, charts, and other visuals (such as diagrams and scatterplots). In order to make the test challenging, the ACT tests these basic skills of reading visuals in unique ways, using strange graphs that you will have never seen before. Labels are very important. For the questions you can’t answer using the visuals, answer them by reading the passage. The only questions you will not be able to answer with visuals or the passage are prior knowledge questions, one to five questions per test. The ACT Science section tries to make the passage more difficult by throwing in large scientific terms. Do not be afraid of them. The ACT typically either explains what the words mean or it is not necessary to know what the words mean to answer the question. The only exception to the skimming rule is on the Conflicting Viewpoints Passage. You need to fully read the entire passage. You need to figure out how the two scientists, students, or theories differ in opinion.